July has been a busy month for me, in terms of the SleuthSayers blog--it has five weekends, so it was my duty to post three columns, on the 1st, 3rd, and 5th Saturdays. For this last assignment, I thought it might be fitting (and, yes, easy) to talk about four of my short mystery stories that appeared in publications with a July 2017 issue date. Three of them were in magazines, one in an anthology. 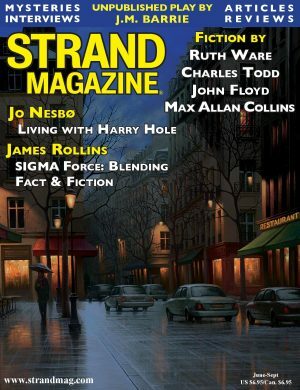 First, I was fortunate enough to be featured alongside three of my fellow SleuthSayers--R.T. Lawton, O'Neil De Noux, and Steve Liskow--and two of my old friends--Joe D'Agnese and Robert Mangeot--in the July/August 2017 issue of Alfred Hitchcock Mystery Magazine (which actually went on sale last month). My story there, called "Trail's End," is the first of a new series featuring rural sheriff Ray Douglas and his lawyer/mystery-writer friend Jennifer Parker. The two of them are in sort of an on-again-off-again relationship and, not surprisingly, wind up in the middle of a murder investigation on their way back from a trip to New Orleans. NOTE 1: After finishing several drafts of this story, I was having a hard time coming up with a suitable title, so I changed the plot around a little, placed the murder scene at a motel, put it at the end of a road at the edge of a swamp in the middle of nowhere, and named the motel the Trail's End. NOTE 2: Someone recently asked me why the women in my stories are usually smarter than the men. I replied that I try to write fiction that comes close to the way things are in real life. One more thing about this story. An old friend from my hometown named Cheryl Grubbs told me a couple of years ago that she hoped I would one day use her as a character in one of my creations. As fate would have it, Sheriff Douglas's deputy in this story is named Cheryl Grubbs. And by the way, the second installment in the series has been purchased by AHMM and will appear sometime in the coming months, so Deputy Grubbs will be back again then. Cheryl, if you're reading this, I hope you'll like her. My second July story, "The Rare Book Case," also came out in late June, but appeared in Woman's World's July 3 issue--WW copies go on sale almost two weeks before the issue date--and is an installment in my series about retired schoolteacher Angela Potts and her former student Sheriff Charles "Chunky" Jones. Most of the stories in that series were written for Woman's World, but other Angela/Chunky adventures have appeared in Amazon Shorts, Flash Bang Mysteries, Rocking Chairs and Afternoon Tales, and my short-story collection Fifty Mysteries: The Angela Files. This one is set on the Fourth of July, and involves the theft of a rare first-edition novel from a locked case at Abner Smith's bookstore. The thief, long gone now, was seen by one of the store's customers but not by the owner, and when the sheriff is summoned certain things in the customer's description of the suspect don't seem to add up. Fortunately the bossy Ms. Potts--who as usual is on the scene even though she probably shouldn't be--is especially good at that kind of math, and saves the (Independence) day. My third story of the month, in the Summer 2017 issue of B.J. Bourg's Flash Bang Mysteries, is a new episode in a series I've been writing for a long time, featuring Sheriff Lucy Valentine and her mother Frances. Fran usually helps her daughter solve mysteries (whether Lucy wants her to or not), but her main goal is to get Sheriff Valentine married so Fran can become a grandmother, a mission that has so far been unsuccessful. Other stories about these two, which I've named the "Law & Daughter" series, have appeared in Sherlock Holmes Mystery Magazine, Mysterical-E, Woman's World, Futures, Mouth Full of Bullets, Seeds, Kings River Life, my short-story collection Dreamland, and several anthologies. "The Sandman" is possibly the most intense of the stories I'm discussing here, but I still tried to plug a bit of humor in. The title refers to a character named Sanderford, and the plot involves a couple of underworld loan-sharks who target the owner of a local bar. This mystery is more of a howdunit than a whodunit, with a few twists thrown in (I can't seem to resist that), and was great fun to write. I'm especially honored to have been featured in this book alongside friends Michael Bracken and Alan Orloff. Noir at the Salad Bar was released on July 18. I also have another Woman's World story, called "Mr. Unlucky" out right now, but its issue date is August 7 so I'm not counting it as one of my July stories. (That issue appeared at our Kroger store on July 27, so I picked it up yesterday along with a jug of milk and a loaf of bread. Seriously.) This was my 89th story to be published in Woman's World, and in recent weeks I've sold them #90 and #91. So far, 82 of those have been installments in my Angela-and-the-Sheriff series. "Mr. Unlucky" is a whodunit about a robbery at a local furniture store, and involves a mysterious note on which is written the name of an old TV show and movie called Mr. Lucky. I'm a certified, card-carrying movie addict, so anytime I can work something cinematic into one of my stories, it makes it even more fun to write. Upcoming is a Labor Day story scheduled for the September 4 WW issue (on sale August 24) and a murder mystery in the September 18 issue. Breaking news . . . 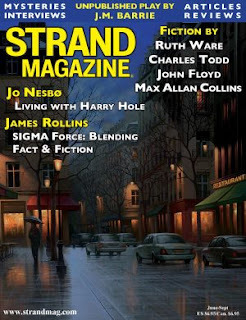 I only just found out that I also have a story in the current (June-Sep 2017) issue of Strand Magazine, just released. Yes, as I said, I know that makes five stories rather than four, but instead of changing the title of this post at the last minute, I figured I'd tack this onto the end. The story is "Crow Mountain," about a fisherman who encounters an escaped convict deep in the woods, and what happens as a result. If you pick up this issue, I hope you'll like the tale--it's a little different. And I'm proud to have been featured alongside one of my longtime heroes, Max Allan Collins. Anyhow, that's my midsummer report. (You might notice I didn't mention my rejections, which are many.) If any of you have recent--or not-so-recent--successes to announce (publications, acceptances, completions, etc., of either shorts or novels), please let me know via the comments section below. Everybody likes hearing that kind of news. Speaking of fortunate events, today is our wedding anniversary. Carolyn and I were married 45 years ago in a galaxy far, far away (Oklahoma), and tonight most of our kids and grandchildren will be here at our house for dinner. I can't think of a better way to celebrate. Familywise AND writingwise, I wish all of you the best. Wow, John, you weren't kidding about July being a banner month for you. Congratulations on all your stories getting birthed and most especially on your anniversary! Congrats on the great writing success this month—and always! And happy anniversary to you and Carolyn as well! Happy anniversary and congratulations on all your story sales. Your productivity is really impressive! Thank you, Paul, Art, and Janice. It has been a good month--and a good 45 years! Hoping August brings more sales and cooler temperatures--probably just wishful thinking on both counts. Happy anniversary, John. I wish you and Carolyn many, many more happy years together. Thanks, Michael, for the well wishes. Best to you and Temple. It's raining here at the moment, but we're expecting a good day anyway. Congratulations, John! Five stories AND an anniversary? That's a busy and happy month! Many thanks, Alan! As I mentioned to someone the other day, a banner month usually means a dry spell's coming soon to offset it--but it really is fun when several stories appear around the same time. Looking forward to reading your story in Noir at the Salad Bar, old friend. I'm pleased to be in there with you! Hey, Eve--thank you for the kind words. Glad you liked the stories! A writer always hopes that series characters will be fun for the reader, because they're great fun to write. Most of my AHMM stories have been standalones, but thought I'd try this for a change. A good month for you, John. And, happy anniversary to you and the missus! And you scoff when I call you one of the kings of the short story. Way to go. We all know how easy it is. Like Hemingway said about sitting at a typewriter and opening a vein. Larry, thank you!! I was indeed fortunate this month, and way more fortunate 45 years ago today. O'Neil, the only thing I'm king of is my little home office, and I'm not even sure about that--but I appreciate the kind words. As for how easy all this is, it does FEEL easy at times (the Zone, right? ), but sometimes Hemingway's take on it is more true than not. Congratulations on your anniversary & the publication of "all" those stories! I've read the two in Woman's World & I even guessed the solution to the Mr. Lucky story. It's not quite the same thing, but do you know you can play tunes on touchtone phones? My sister & her husband, when they were first married, had phone number 998-5778, which plays "It's So Easy to Fall in Love". Thanks, Liz! My stories seem to be bunched into two groups: the long standalone stories and the series mini-mysteries. Glad to hear you've read a couple of the minis, and liked them! The fun to those is in coming up with the clues and solutions, which I always hope are at least a little challenging. Okay, I'm off now to play songs with my touchtone phone. John, happy 45th Anniversary to you and your bride. Not that I idolize your story work ethic or anything, but if you keep on with such a huge acceptance rate, I may have to consider adopting a pen name such as J. Ohn Floyd to hopefully increase my own sales. Happy anniversary, John (and Carolyn). I liked Trail's End in AHMM, and I've ordered Noir at the Salad Bar because I know several writers in the collection, including you, of course. One reason I want to learn to write more short stories is that more new markets seem to be appearing, and some (like Level Best) are looking at intriguing themes and premises. Enjoy dinner and the family reunion. And let us know how many stories come out next month, too. R.T., you might want to try S. Tephen King instead. And you are too kind--the truth is, I still get a boatload of rejection slips. Thanks for the well wishes! Steve, I thank you also. Yep, getting together with the kiddos is always fun, and being here with all of them tonight will be better than going out to dinner, as we sometimes do on these special occasions. Looking forward to that. As for story output, I really don't know where all these plot ideas come from, but I keep getting them and it seems the only way to get rid of 'em is to put them on paper (or, more accurately, on a hard drive). Glad to hear you liked "Trail's End"--that story came together fast, and was one of those that was a LOT of fun to write. The sequel too, though I'm not yet sure when it'll be in the magazine. And I hope you'll enjoy Noir at the Salad Bar--I've not yet seen a copy either, and I'm looking forward to all the stories there. And congratulations on all the stories! That's a truly amazing record for one month. I've read one of the stories you mention--the AHMM one, as you might guess--and I thought it was excellent. I loved the twists at the end. Thanks, Bonnie! Yep, sounds as if we don't have much of a head start, over you two. Congrats on your 44th! As for the stories, I was fortunate there, and it was surprising that so many appearances came in the same month. Glad you liked the AHMM story!! Please give best regards to Dennis. Happy anniversary, John! And congratulations on all the stories. Your success is so impressive. How kind of you, Barb. Having a great time with all these stories--as I know you are too. Many thanks!! Wow, John! You've been working hard for sure. Congrats on all the success. I enjoy all of your stories and characters and can't wait to read these. And Happy Anniversary! That's awesome, too. I hope your time with family was lots of fun. Hey Mary Ann!--Thanks for the note. Yep, staying busy, and our anniversary WAS fun! Best to you and family. Happy anniversary John! And congratulations on your publications. I read Trail's End in AHMM, and very much enjoyed the story. Thanks, Cathy!! Glad you liked the Hitchcock story. Keep up the great writing!